Paint Draw Paint, Learn to Draw: Drawing Basic: Starting a figure drawing from life. Drawing Basic: Starting a figure drawing from life. I like to draw using a living model as reference as often as I can. Here I can practice what I have learned about drawing the figure, work out new ideas I want to try, or simply draw to enjoy the experience. I find drawing from life both fun and rewarding. I usually go to drawing groups or invite a few friends to pitch in to hire a someone to model for us. The advantage to these options is that it makes drawing from life much more affordable. The disadvantage is that I have less input over the set up and length of time for each pose. I like long poses that allow me the chance to work slowly but this opportunity does not always present itself in the drawing sessions. In turn, I have had to learn to be more economical in my approach to drawing and have learned some ideas on how to set up a figure drawing quickly. Today, I thought I would share one way to set up a figure drawing while working in a drawing from life session. The steps are straightforward as they build on one another allowing me to get much of the information I need down quickly. One of the first things I like to do is to find the general gesture of the figure. This a line or lines that suggest the position or movement of the figure in the most general sweeping terms. In this case, the model is siting with her head down and turned away from view. I saw the general gesture as curved or bent. Next, I will draw in a couple of the larger masses I find important in helping me establish some key reference points to build from. I will draw the masses as simple shapes. After I draw the shapes I look to see if the placement and size is what I want. Here I have drawn the head, ribcage, and pelvis as basic shapes. Using the shapes I laid down, I might draw something to indicate the volume of those masses. This will serve as a guide to allow me to understand the figure in three dimensions as I draw. Next, I like to start mapping out the outside boundaries of the forms of the figure. I am looking at size and proportion while doing this. I am looking for such things as how the width of the torso relates to the length. These lines are just loose guides. I will be refining and adjusting the shapes as I continue to draw. Since I might move these lines I don't worry about getting the exact contour down. I just try to indicate the form in broad simple terms. After mapping in the edges of the figure I look for the basic forms I can find within the figure. All I need is a few lines to indicate the volume of each shape. 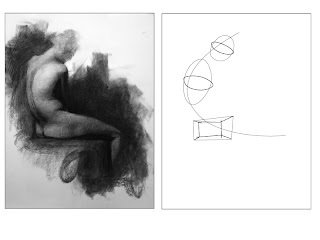 Once the basic shapes and volume of the forms are established I can begin to look for how the surfaces of the figure are structured. At this point, I will start drawing in the directional changes in surface planes. Now its just a matter of moving in from the large surfaces to the smaller ones. I use the larger surface planes as a guide to help me find and place the smaller ones. Once I get to a point where I am happy with the amount of structural information about the figure I have down on paper, I start to think about value pattern and shading. The lines I have drawn will serve as a guide in this process. Also remember that this is just one approach. There are many other ways to get the same results, use what works for you. I really liked this post. Now when I draw my humans I start with a line that captures the "gesture." I find that my subjects appear much more natural and dynamic as opposed when I started with a stick figure. 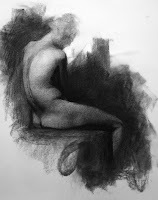 This site offers drawing and painting tips, techniques, and instruction for anyone interested. Oil Painting For Beginners - Get free oil painting instructions and other tips here. All Rights Reserved © Ross Bowns 2010 - 2014. Powered by Blogger.